Ever since Geely acquired Volvo 10 years ago, its progress in the automotive field has been nothing short of spectacular. Technology sharing has played a crucial role for the Chinese giant, and the upcoming Geely FY11 will take that synergistic relationship to another level. What you see here is Geely’s new coupe SUV, codename FY11. It’s not officially on sale yet, but we know that the sporty five-seat SUV will ride on Volvo’s Compact Modular Architecture platform (a first for Geely), one that underpins the impressive Volvo XC40. We find the chassis to be very well-rounded, so there’s no doubt the FY11 will use that to its advantage. We don’t know much about the FY11, save for the fact that it will utilise a 2.0 litre turbocharged four-cylinder engine that makes 235 hp and 350 Nm of torque. As per the XC40, the FY11 will be available with front- and all-wheel drive configurations. In any case, the FY11 will be the most driver-centric model yet. Design-wise, the FY11’s front fascia gets a sleeker version of Geely’s expanding cosmos grille, which also features a chrome strip at its base to link the “arrow-inspired” headlamps. Other details include a wide lower intake and prominent contour lines on the bonnet. The red and grey models seen here ride on 19-inch dual tone alloys. The rear of the FY11 features slim tail lights with a lighting signature that draws inspiration from the Chinese fan, a styling element also found on the Borui GE. Like the front, a chrome strip links the two clusters, with Geely script. Inside, the interior design places similar emphasis on the person behind the wheel. The driver gets a flat-bottom steering wheel and digital instrument panel, and the door cards are designed based on the traditional art of origami folding. 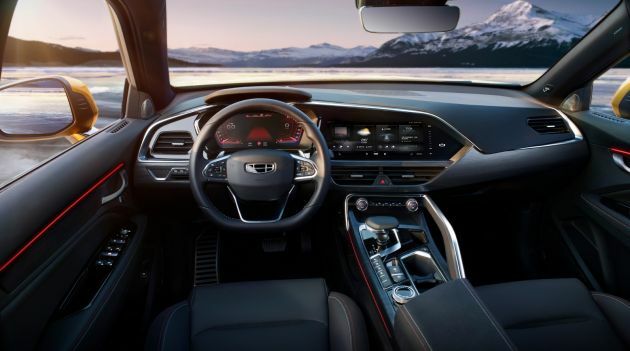 In the middle, the dashboard features an asymmetric design and the large integrated infotainment screen adopts a “flying wing” design that is angled slightly towards the driver. The dual layer dash gets a chrome strip that outlines the centre dash, and the use of matte black surfaces help create a unique three-dimensional visual effect. As for the centre tunnel, one will find an airplane throttle-styled shifter and metallic handrails. Like the screen, these are also tilted slightly towards the driver. Ambient lighting can be found on the doors and central tunnel. The seats, meanwhile, are inspired from race car bucket seats (but prioritises comfort) and the headrests are designed based on those found in first-class airline cabins. 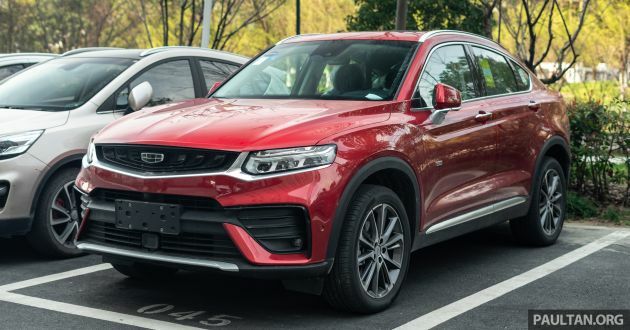 At launch, the Geely FY11 will take on the BMW X4 and Mercedes-Benz GLC Coupe, and will likely feature Volvo’s electrification and active safety technologies as well. Like what you see, guys? Looking forward to this car coming to Malaysia. Now we know for sure, all Proton models will be wiped out completely to make way for Geely to market all their models in Malaysia. We are lucky to get good quality cars from Geely. Pity, 30 years we waited for good quality and high safety spec from our National car company but nothing came. Proton is better than Mercedes Benz or BMW. And Proton has been making lots of money every year since 2000. Firstly, locals must buy brand new Proton cars. Not choosing used Honda and Toyota wish, city, vios, jazz, crv, almera and civic..
You sure love to reply after reply after reply your own comments. Do seek professional help. So I don’t know how Geely can produce better cars than Proton and they are making so much of profit. Some say Proton has better RV and reliability than BMW/Mercedes. This I agree. So john was right after all! Sick & tired of all these false accusations. the only mistake you made is to say proton cars are wiped out to make way for geely to market its models here.. BECAUSE.. as long as its sold with a proton badge, it is a proton car, doesnt matter where it comes from. Same with how VW started with Skoda and SEAT as just one example of rebadging that happens all the time in the automotive world.. so why do you continue to harp about something that isn’t true? This thing is gorgeous but still pictures can be deceiving. If they really got the proportions right, it will sell well based on it’s looks alone. The only thing to fear is the price since it’s pitting against X5 and GLC Coupe, albeit it might be priced higher than the usual Geely stuffs. Can we have a smaller 1.5L instead with a 17 inch as an entry level? Another Game Changer from China. Habisla all Game Over Proton models!!! Its not technology sharing. Its acquiring of technology. If things are left to the Chinese then you know whats gonna happen. Just google Tang Hua or Yuelang to know (just a little) what i meant. That will kill you (heart attack) for their looks alone. You will be missing a leg god forbid you drive them, due to serious safety issue. You must be really mad to buy the car, in those days. But ever since they started to buy peoples work, all things forgotten about horrendous and non existing safety issues. Doesn’t matter, as long as looks good, well equipped specs, low maintenance cost and affordable pricrle! There are many copy cats in China but it does not mean FY11 is a cheap imitation of GLC. You could say that GLC coupe copied the BMW X6. Moreover, Japanese automakers have been copying designs for decades, MR2 is a copied of Ferrari, Landcruiser2 copy of Landrover defender, are some examples. Spiritual successor to my Gen2. Hope they will call it Gen2 or G2 when it comes here. Correct! Spiritual Game Changing successor to your Game Over Gen2. Habisla all Proton models!! Bosch starter and motor generator division, in progress jadi China punya. I will say. Even the interior have hints of Gen.2 inside. The red dash on the door cards reminiscence of the same dash on Gen.2 CPS door cards. And the semi-bucket seats? Very similar concept to the semi-bucket seats on the Gen.2. Take on the X4 and GLC Coupe you say? It better not have the same kind of pricing! If the X70 is anything to go by this fella won’t be cheap. Will Malaysians be open to purchase one for 150k and up? Lol! Much like BMW’s X6 commands a bit of price premium over their X5, so it is natural for Proton FY11 to be prices slightly higher than their X70 if it comes on sale here. Will Malaysians be open to purchase? Yes, they will based on the numbers for X70. As for the take up, it will unsurprisingly be lower than X70 but then again so as the take up of BMW X6 compared to X5. New 2022 Proton Gen2 2nd generation. A big WOW! Come on proton. Listen to us. We really want this more compare to that x70 or x50 oldies design. Bring it here n give ur best shot to make this as proton’s mid suv. Definitely they will sell like hotcakes easily! Perodua needs work harder on headlights design, add on some interior soft touch materials and car infotainment system (android players & more speakers + subwoofer) to catch up with Proton in future. If not, if proton selling X50 at Aruz price… perodua sales will have big impact! Proton = Geely = Volvo ??? Maybe when it arrives here the price will be from 135K – 150K. If this sold under Proton badge it’s definitely gonna be no less RM200k…Netizen already hesitated to buy Proton at RM100k let alone 200k. 20,000 and counting disagrees with you. Chinese automotive is no go, why must u glorified a mediocre brand?regardless even if its own volvo.volvo is way behind the german premium.so stop the brawn nosing. Volvo is ahead of the game in terms of safety (passengers & pedestrians) and have a big leap in terms of autonomous driving compared to the Big 3. So do share what you mean by “behind”? the only no go here is your mentality, LOL.